This car was originally a California car. The owners moved to Minnesota in the mid 90's and after one year there traded the car in to a small dealership. A girl from CT, going to college in MN, purchased the car and drove it there for her tenure in college and then drove it back to CT. It is believed that the dealership changed the color from a cream color to the current "burgundy". It is also believed that they changed out the entire drivetrain/running gear to that of a 1964 Monza Spyder including the wiring harness too. It is unclear how many miles may be on the car, although the odometer reads 29,374. The car was then purchased in the late 90's by the current owner, driven a short bit and put away with the idea of doing a restoration. That was over 20 years ago. 2 years ago the car came out of storage and was recommissioned to be driven again. The car starts right up and runs strong, pulls hard through the gears and the compression is up around 120 for all six cylinders. 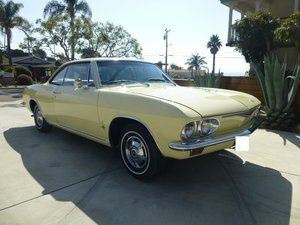 However there is a clicking noise that has been diagnosed by several Corvair experts as a ridge in one of the cylinders as all of the valves are moving and free and the bearings were found to be good. The flat six puts out 150 HP in a 2400 lb car, so she moves surprisingly quick. Mated to a four speed, you can pick your gear for the best RPM to use for optimum enjoyment. When the car was recently recommissioned, the oil and filter was changed out and Hemmings ZDDP oil used. New gas tank, filters, pump and sending unit were installed. New Cap, rotor, plugs and wires installed and the brake system was done over including some line replacement, e-brake cable and master cylinder. LED taillights and electronic blinker set up. The body is fairly solid, the floors were replaced when the car was purchased by this owner. There is some rust through in the typical rear wheel well openings and surface rust throughout a good deal of the undercarriage. Four vintage ET mags were sourced when first purchased. w/ red stitching). Set of blue LED bulbs for dash lights, good used visors, extra stock wheel,new exhaust crossover pipe w/gaskets, extra gaskets, new fan belt, two sets of factory shop manuals (one very nice, one in 3 ring binders for shop use), MN title and several other Corvair books. Great little driver, mechanically sorted needs some body work and paint. Please don't hesitate to contact me with any questions, comments, offers or to schedule a time to see her.